In my home, August is birthday month! Both my kids (and myself) were ALL born in August! So, at about this time each year I enter party planning mode! Birthday parties in general can get a little expensive, but when you have TWO kids to buy presents for too... well, it's like another Christmas in our house! Thankfully, this mama is a bargain shopper! So today, I'm sharing my personal tips on party planning without breaking the bank! Now not ALL DIY party ideas will save you money, so you'll want to be careful with this, BUT some areas will save you money. For instance, cook yourself rather than catering. Bake your own cupcakes. I find cupcakes to be easier to decorate than a cake--- add on some sprinkles to cover imperfections and make your own cupcake picks with toothpicks and pictures printed off the internet. Games, invitations, etc can often be found for free online, or again, create yourself! Chances are whatever the theme your child decides on, they're a big fan, right? Which means they probably already have toys! Incorporate these into your decor. I love a good themed plate and napkin, as do my kids, but those can get REALLY expensive for a larger party. Instead, I buy 1 package of each! When I'm setting up the party, these are the pieces I have out to add to my theme, but for the rest--- I keep it simple! They don't ALL have to be fancy plates. If you're planning a lot of kids, you might go with two of each to keep it fair, but generally for us, 1 is plenty! You might not know this about me--- but I love the Dollar Tree. I'm often found saying, "No, don't get that here, we can check the Dollar Tree!" I mean, why pay more than $1 if you don't have to. They are GREAT for parties. Simple plates, plastic-ware, balloons, streamers and more can all be found right there! They even have helium balloons (though they will not fill packaged balloons). You can also find gift wrap and gift bags too. I always check here before heading anywhere else! It can be really easy to fall into the trap of wanting that Pinterest-perfect party, and don't get me wrong, I love party planning too... but if that's not your thing, don't stress it! You don't have to go all out and break your budget to have a fun party. My kids have had every detail themed perfectly parties and they've had just invite everyone over, no decorations parties...and I can tell you they've enjoyed them equally! They don't care about how fancy or expensive it is. They'd be happy with Little Caesers and squirt guns in the back yard! When shopping online for ANYTHING, I don't check out without checking for coupon codes! Head over to Dealspotr and search your favorite party supply store to see what offer they have available. Party City almost always seems to have some promotion going on, and I'm sure others do as well. 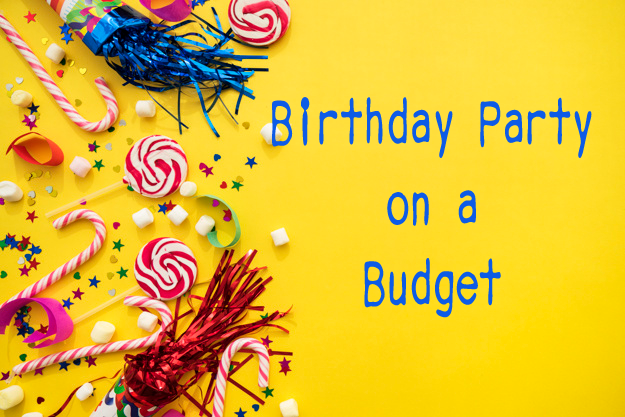 Are you a budget friendly party planner? What are your best tips? I love all these ideas for budget friendly birthday parties. Everything costs so much these days that you have to cut corners where it doesn't matter. It's also cheaper to bake your own sheet cakes & decorate them than purchase from the store bakeries if you can. I like some of your ideas! Especially the one,if your kids are wanting a certain theme for the party,& using some of their toys on hand to decorate.I'm like you,I always make the food myself & cut cost! Birthdays can add up so quickly. Great ways to save!